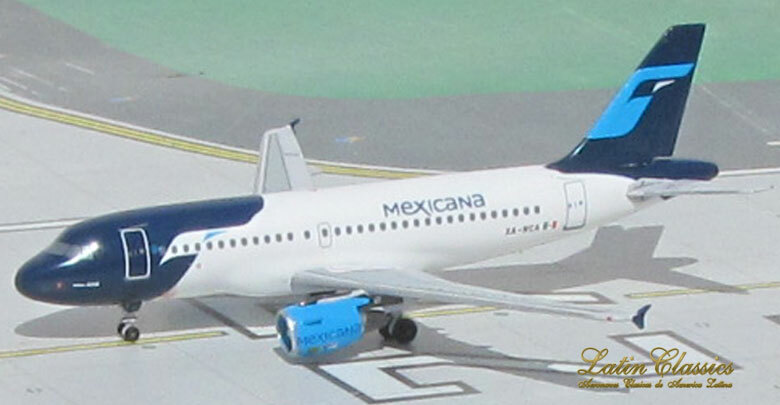 Latin Classics Models: one limited edition collectable, die-cast metal airliner model in a 1/400th scale of an Airbus A321-211 in the LATAM Airlines NEW Color Scheme. Airframe Registration CC-BEP. This model is constructed of die-cast metal with some plastic parts. This product is available beginning in June 2017. Latin Classics Models: one limited edition collectable, die-cast metal airliner model in a 1/400th scale of a McDonnell Douglas DC-10-10 in the Mexicana Airlines Old 1990s Green Pattern Colors Scheme. With titles Ixtlan. Airframe Registration N907WA. This model is constructed of die-cast metal with some plastic parts. This product is available beginning in November 2017. Latin Classics Models: one limited edition collectable, die-cast metal airliner model in a 1/400th scale of a McDonnell Douglas DC-10-15 in the Mexicana Airlines Old 1990s Yellow Pattern Colors Scheme. With titles Ixcamilpa. Airframe Registration N1003W. This model is constructed of die-cast metal with some plastic parts. This product is available beginning in November 2017. Latin Classics Models: one limited edition collectable, die-cast metal airliner model in a 1/400th scale of a McDonnell Douglas DC-10-15 in the Mexicana Airlines Old 1990s Purple Pattern Colors Scheme. With titles Mazaltepec. Airframe Registration N10045. This model is constructed of die-cast metal with some plastic parts. This product is available beginning in November 2017. 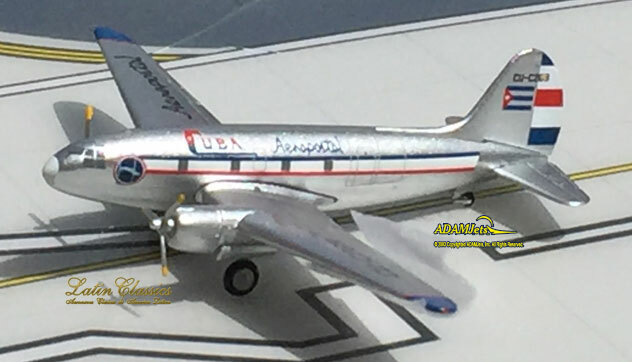 Latin Classics Models: one limited edition collectable, die-cast airliner model in a 1/400th scale of a Douglas DC-8-61 in the Pluna Uruguyan Airlines "Hybrid" Colors. Airframe Registration 5N-HAS. This model is constructed of die-cast metal with some plastic parts. This product is available beginning in August, 2013. Latin Classics Models: one limited edition collectable, die-cast metal airliner model in a 1/400th scale of a McDonnell Douglas DC-10-30 in the Varig Brazil Airlines Late 1990s Colors Scheme. Airframe Registration PP-VMB. This model is constructed of die-cast metal with some plastic parts. This product is available beginning in May, 2004. Latin Classics Models: one limited edition, collectible die cast airliner model in 1/400th scale of a McDonnell Douglas DC-10-30 in the Varig Brazil Airlines Hybrid 1980’s Colors Scheme. With a White Belly finish. Airframe Registration PP-VMZ. The model is constructed of metal with some plastic parts. This product was released in August, 2018. 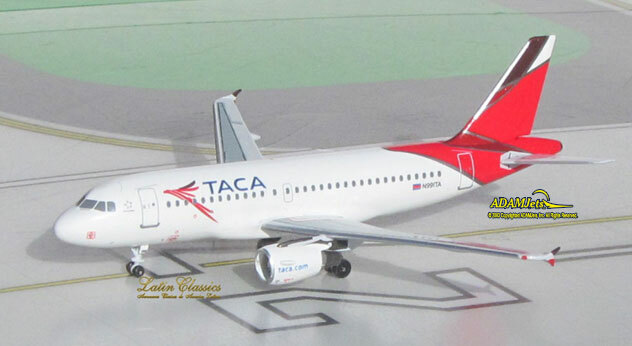 Latin Classics Models: one limited edition collectable, die-cast metal airliner model in a 1/400th scale of a Douglas DC-8-53 in the VIASA Venezuela Airlines Last 1980s Color Scheme. With Viasa tail titles. Airframe Registration YV-132C. This model is constructed of die-cast metal with some plastic parts. This product is available beginning in February 2017. Latin Classics Models: one limited edition collectable, die-cast metal airliner model in a 1/400th scale of a Douglas DC-8-53 in the VIASA Venezuela Airlines 1970s Old Color Scheme. With original Oval Logo and Venezuela titles. Airframe Registration YV-129C. This model is constructed of die-cast metal with some plastic parts. This product is available beginning in February 2017.